Firefighters have dealt with a grass fire, which stretched a mile in length after rescuing a man trapped in his vehicle by the flames. Fire crews spotted Arwyn Davies after being called to the gorse blaze at Glyndyfrdwy, Denbighshire, just before 16:00 GMT on Tuesday. Firefighters cleared a path so he could be rescued from his tractor, and crews remained on the hillside overnight. Mr Davies was transferred to a hospital in Stoke for treatment. He had initially been taken to Wrexham Maelor Hospital. His injuries are not yet known. Rhys Hughes, a farmer and neighbour of Mr Davies, said he was "very concerned as a farmer and very concerned that a friend of mine had been injured". He added farmers must make fires on their land at certain times of the year to "avoid catastrophes" in warmer weather, but said he had "never known February this dry". Four appliances and one specialist vehicle were working at the scene. About 500m of the blaze had been inaccessible, according to North Wales Fire and Rescue Service, with firefighters using beaters to try and extinguish the flames. Staff from Denbighshire Council's countryside service also provided assistance. Fires near Brynberian, Pembrokeshire and on Conwy mountain were also reported on Wednesday afternoon. Meanwhile, fire crews in south and mid Wales said they were busy with grass fires on Tuesday but they have all since burned out. 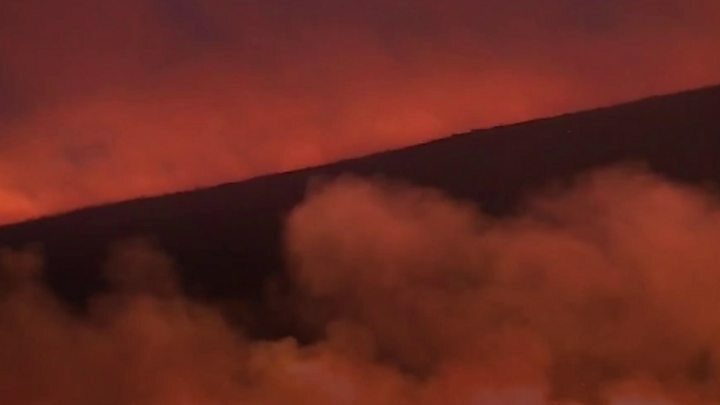 There were eight separate fires reported in Aberdare and a wildfire at Mountain Ash destroyed about 30 hectares of grass and gorse. There were also grass fires near Aberystwyth. Firefighters also tackled mountain fires at Amlwch on Anglesey, Llechwedd in Gwynedd and Llannefydd in Conwy.